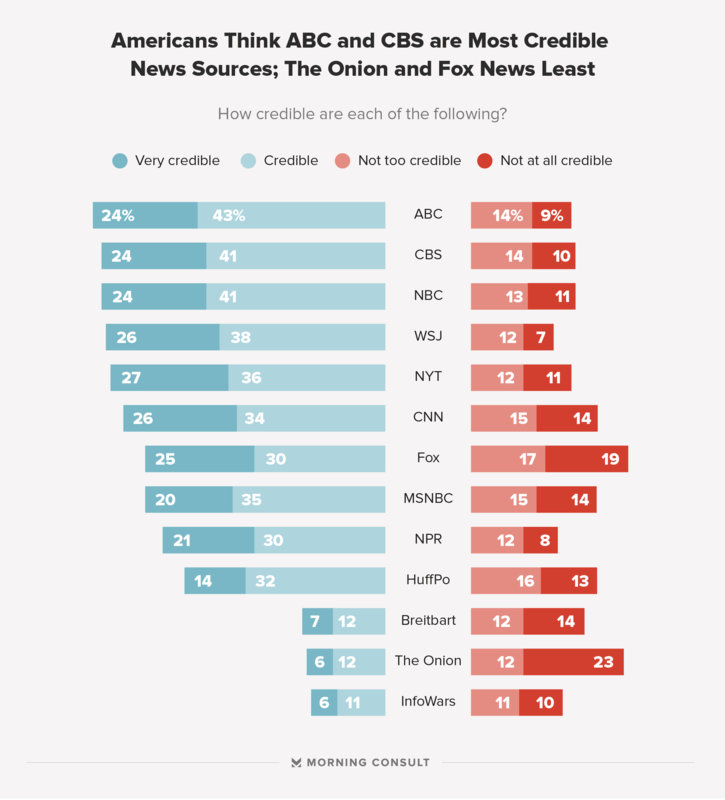 In spite of Trump’s impression of the media, a recent study by Morning Consult found that the majority of the people find the major media outlets are credible. At the top, ABC News was found credible by 67%, CBS by 65%, The New York Times by 63% and CNN by 60% of the public. It is not the Trump administration alone that seems dysfunctional these days but many parts of our world where the extremists are becoming increasingly popular, let alone running the government, are going through similar malaise. Like Trump, the leader of the populist Freedom party of Holland – Geert Wilders – went on to tell his bigoted supporters to ‘make the Netherlands ours again’. He wants to ban the Qur’an and expel the Moroccans from his country. He has been leading opinion polls for several weeks and his progress is being monitored carefully by politicians who fear European politics is lurching heavily to the right. The shift rightwards in Dutch politics has been happening for over a decade, since firebrand Pim Fortuyn burst on to the scene in the early 2000s, with a new form of populism that would be adopted by other far-right groups across Europe. France is heading towards a presidential election next spring in which the populist, anti-EU leader of the Front National, Marine Le Pen, is widely expected to reach the second round runoff. François Fillon’s bid for the French presidency is already suffering from the fallout of a scandal over disputed payments to his wife. According to a poll carried out since the scandal broke, 61 percent of French voters have a “negative” or “very negative” view of the conservative former prime minister, while the proportion of “positive views” of Fillon plummeted to 39 percent from 54 percent before “Penelopegate” became top news. If Le Pen wins, that would bring about the cataclysmic and existential end of the EU. In the 4th quarter of this year, Germany goes to the poll. Up until very recently, Berlin’s chattering classes believed a fourth Angela Merkel term was inevitable. Love or hate her, Merkel was alternativlos, without alternative, as the common refrain had it. The upcoming campaign “will be the hardest I’ve ever experienced,” Merkel acknowledged on Monday in Munich. The wild card in the election is the Alternative for Germany Party, the right-wing, anti-immigrant, anti-Islam, Eurosceptic party. Not everything is lost though. A truce between Russia-backed separatists and the Ukrainian army will come into force on Monday in eastern Ukraine, according to Russia’s foreign minister. The deal was brokered on Saturday at the Munich security conference with the participation of Ukraine, Russia, Germany and France. “It is positive that the contact group [of foreign ministers of the four countries] agreed once again for the start of a ceasefire on February 20,” Sergey Lavrov, Russia’s foreign minister, said at the Munich Security Conference on Saturday. He said that the time when the West called the shots was over while NATO was a relic of the Cold War. In its place, Russia wanted a relationship with the US that is “pragmatic with mutual respect and acknowledgement of our common responsibility for global stability”. On the campaign trail, Trump repeatedly praised Russian President Vladimir Putin and voiced his willingness to work with him in fighting “terrorism”. Exasperated and worried by Trump’s calling into question long-standing foreign policy assumptions, European leaders have urged the US not to take transatlantic ties for granted. On a European roadshow this week, Trump’s lieutenants have sought to reassure jittery allies that the administration will hold fast to existing foreign policies, including maintaining sanctions on Russia over the Ukraine crisis. Hours before Lavrov addressed the conference, U.S. Vice President Pence told the same forum that the US will stay loyal to its old friends. “The United States is and will always be your greatest ally. Be assured that President Trump and our people are truly devoted to our transatlantic union,” Pence said, adding that America strongly “supports NATO”. “Let no one doubt our commitment,” he said. At NATO headquarters in Brussels on Thursday, James Mattis, the US defense secretary, said Russia must first “prove itself” and respect international law before there could be any improvement in relations strained by Russia’s Ukraine intervention and annexation of Crimea. Last week, during his visit, Mattis has told fellow NATO members to increase military spending by the end of the year, or risk seeing the US curtail its defense support. “If your nations do not want to see America moderate its commitment to this alliance, each of your capitals needs to show support for our common defense,” Mattis said. He told the alliance’s 27 other defense ministers to adopt a plan that sets dates for governments to meet a military funding goal of 2 percent of gross domestic product. Mattis’s message to his counterparts in Brussels follows years of demands by the US for allies to spend at least 2 percent of their GDP on defense, a goal that only a handful meet despite agreeing to it at a summit in 2014. Currently, only the United States, Britain, Estonia, Greece and Poland have hit or surpassed the 2 percent figure. The Saturday conference was Merkel’s first face-to-face meeting with a senior figure in the new U.S. administration and Pence’s first trip abroad as vice president. Last week, the Israeli Prime minister Netanyahu came to the White House where Trump sounded to abandon the long-held “two-state” solution for Palestine. “I’m looking at two-state and one-state, and I like the one that both parties like, I can live with either one,” he said on Wednesday, during a joint news conference. On Wednesday, UN Secretary-General Antonio Guterres had warned during a visit to Cairo that there was no viable way to end the Israeli-Palestinian conflict other than the establishment of a Palestinian state co-existing alongside Israel. The BDS movement, which is a global campaign urging individuals, companies, and states to apply economic pressure on Israel until it complies with international law in its treatment of Palestinians, has faced a barrage of legislative initiatives in the United States over the past year. The purpose of these initiatives is to prevent public bodies from doing business with entities supporting the movement. Nonetheless, these legal challenges, while significant, point to the fact that BDS is gaining traction beyond college campuses. President Trump has surrounded himself with many extremists and bigots, which is not a good sign for a country that for nearly half a century has tried to sell itself as the bastion of tolerance, inclusion and freedom.